Over 700 years ago the people who would become known as the Maori first arrived in New Zealand. These initial explorers would be followed by waves of Polynesian settlers who would populate the two islands that make up New Zealand. Because of centuries of complete isolation from the rest of the world the Maori people developed a unique culture. This isolation would come to an end with the arrival of European settlers which began in 1769 with Captain James Cook. On this page is a list of interesting facts about traditional Maori culture. This information includes what customs the Maori have, why wars between Maori tribes was common, and how they survived on New Zealand. Maori people define themselves by their iwi (tribe) and hapu (sub-tribe). Within traditional Maori culture experts in various skills arose. These included carvers, tattoo artists, healers, and builders. The Maori referred to these skilled practitioners as tohunga. One striking aspect of the Maori are their unique and beautiful tattoos. Maori tattooing is called ta moko and has traditionally been an important part of their culture. Tattoos were used to show a person's status and rank. Every traditional Maori community has a communal area called a marae. This area contains several buildings that include a wharenui (meeting house) and wharekai (dining hall). 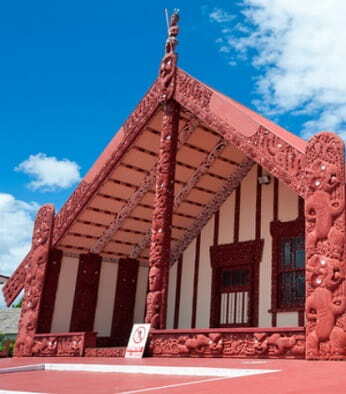 The wharenui (meeting house) located within the marae (communal area) is the focal point for the Maori community and is where meetings and celebrations take place. The Maori historically relied on fishing as one of the main sources of their food. The Maori passed on rich and detailed history and legends orally. Society was organized around groups that traced their descent from common ancestors. Reciting whakapapa (genealogies) was an important way to communicate knowledge. Maori culture is rich with stories and legends. The Maori creation story describes the world being formed by the violent separation of Ranginui, the Sky Father, and Papatuanuku, the Earth Mother, by their children. Many Maori carvings and artworks graphically depict this struggle. Te Reo Maori is the Maori Language. Visitors to New Zealand will discover that numerous places have names that are of Maori origin. At first, visitors may be puzzled by the seemingly impossible to pronounce names. In fact, Te Reo Maori has a logical structure, and, unlike English, has very consistent rules of pronunciation. The Maori Haka is an ancient traditional group dance often performed on a battlefield prior to engaging the enemy or by warriors prior to heading off to battle. There are many different types of Hakas; not all centering around warfare. Traditional Maori clothing included skirts made from flax, a common plant found on New Zealand, and elaborate cloaks for warmth and to indicate status. A cultural tradition of the Maori is a feast centering around a pit in the ground. Food would be put in ovens called hangi. Heated stones would cook the various meat and vegetables. In ancient times wars between Maori tribes was commonplace. These conflicts were most often over territory. In the past, the Maori built canoes (Waka) for fishing and traveling. These canoes ranged in size from small one man boats to large double-hulled war canoes called Waka taua which were as long as 130 feet (40 meters). Today Maori people live throughout New Zealand, and many are actively involved with keeping their culture and language alive. In recent years, the introduction of Maori language nests (kohanga reo) has revived the Maori language. At kohanga reo, preschool children are encouraged to speak in Maori. Primary and secondary schools build on this early immersion by including Maori in the curriculum. Traditional carvers also help to keep Maori culture alive by creating intricate works that pay respect to the past.